In recent years, trauma education has vastly evolved, and frequent mass violence, natural disasters, and other tragic events amplify its importance in social work curriculum. On December 14, 2012, six-year-old Noah Pozner became the youngest victim of the Sandy Hook Elementary School massacre. His horrific slaying alone is enough to be deemed a tragedy in small Newtown, CT, but the fact that 19 other children and six educators also were slain that day is beyond comprehension. Yet for Noah’s twin sister, Arielle, there is no escaping the reality that her brother is gone forever. Just a few doors down the hall when the shooting broke out, Arielle survived. Experts say survivors like Arielle may be experiencing “survivor’s guilt” among other feelings of anxiety and PTSD following the shooting. In the coming weeks and months, it will be vital for these trauma survivors to receive the proper support so they can process their grief as well as the symptoms that may be emerging as they live with the aftereffects of trauma. The emergency responders, including the first police officers to arrive at the school and discover the gruesome scene, also need support. The Associated Press recently reported that symptoms of PTSD were so great for some of the first responders that lawmakers are considered expanding workers’ compensation benefits to help them cope. Beyond the family and friends of those who were lost and the first responders, the Newtown community at large and people across the nation are experiencing feelings of fear and anxiety as a result of the massacre. Individuals negatively affected by this and other traumatic events in our culture prioritize seeking best practices for trauma treatment. Many of today’s social work programs are incorporating trauma treatment techniques into their curricula. And while the face of trauma education in modern social work is evolving, it took a while to get to this point, and there’s still more to do. Over the years, social work programs have infused some elements of trauma education, but the need for greater emphasis on trauma training has become evident. No matter what area of social work today’s students enter, at some point in their career, they likely will encounter clients who have experienced trauma. As the social work profession begins to better understand trauma, the push toward incorporating training into curricula grows as well. The National Center works with schools of social work to provide trauma-informed, evidence-based child trauma treatment education and training, according to Strand. The educational focus in the past always has been more on interpersonal violence, areas such as child abuse or neglect, she explains, but there’s been a growing awareness in the field about postdisaster work, such as after events like the Sandy Hook shooting. The National Center would like to see community-based agencies providing EBTT and the production of more culturally sensitive practitioners. Robert Abramovitz, MD, a distinguished lecturer and codirector with Strand at the National Center, adds that some Newtown responders may have lacked critical training. Lack of training or limited training can be detrimental not only for clients but also for social workers who find themselves unprepared for their cases. Secondary trauma is very real. 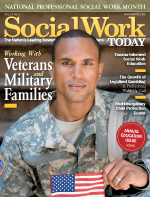 “Social workers need to think about how they will deal with the impact of the work on themselves as they help people heal from traumatic experiences,” says Ellen DeVoe, PhD, MSW, an associate professor and the founding director of the trauma certificate program at the Boston University School of Social Work (BUSSW). At the University of Denver’s Graduate School of Social Work, self-care is an assignment in the first course, says Marian C. Bussey, PhD, LCSW-CO, an associate professor and the director of program assessment and evaluation. Students are asked to create a self-care plan, and literature on secondary trauma is tied into the lesson, says Bussey, who also is program coordinator of the interpersonal trauma studies certificate program. Until recently, many school programs didn’t have a strong focus on trauma education despite the fact that many social workers regularly work with trauma patients. Over the years, the programs that began to adopt trauma education often did so in the form of a trauma certificate program or elective courses. But even that is changing. Reflecting on Newtown and other recent mass shootings and the tasks professionals face when helping trauma survivors, it’s impossible not to consider the importance of trauma education and training and where it’s headed. Bussey says that following the Columbine High School shooting in 1999, she took some training offered by the state of Colorado on disaster response and learned the importance of not forcing traumatized clients to talk about what happened right away. She hopes that the responders in Newtown have gotten the same message. It may take a long time for the shock to wear off, and the people of Newtown need to be treated gently.